The algebraic Riccati equation, denoted by ’ARE’ in the paper, is one of the most important equation in the post modern control theory, playing important role for solving H 2 and H ∞ optimal control problems. The solution of ARE is given in the form of a matrix, and a typical procedure of computing the solution uses eigenvalues and eigenvectors of matrix H, where H is a matrix determined by a given system. With the aid excellent numerical packages such as “LAPACK” for matrix computations, the procedure is quite efficient for the numerical systems (the systems without unknown parameters). This paper considers a system with an unknown parameter k. In this case, the numerical procedure cannot be applied without fixing parameter k to a constant value. Let us consider some symbolic method to compute the solution of ARE which leaves parameter k symbolic. Letting entries of the solution matrix be unknown variables, ARE can be viewed as a set of m algebraic equations with m variables and parameter k, where m is the number of entries of the unknown matrix. 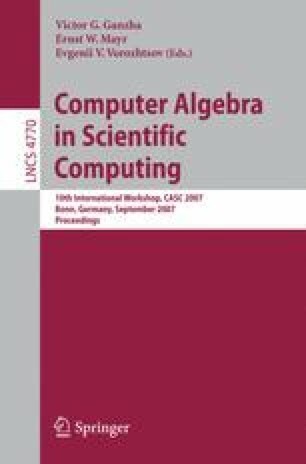 Computing Groebner basis of the algebraic equations with lexicographic ordering, we obtain a polynomial whose roots are the solution of ARE (i.e. the defining polynomial of ARE). Although this method with Groebner basis gives us the defining polynomial of ARE, it is not practical. The method easily collapses when the size of a given system is large because of its heavy numerical complexities. This paper presents a practical algorithm to compute the defining polynomial. The proposed algorithm uses polynomial interpolations, and is easily parallelizable, implying that it is advantageous under multi-CPU environments. Numerical experiments indicate that even in the single CPU environments, the proposed algorithm is much more practical than that with Groebner basis.